At Great Lakes Power Vac (GLPV), our motto is “Cleaner, Safer, Better,” but when it comes to combustible dust, “Safer” comes first. This is how we have become an established leader among industrial cleaners providing services to manufacturing facilities where combustible dust is generated or present. 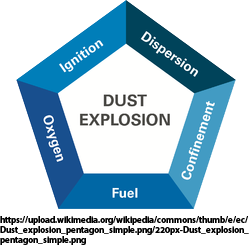 Experience matters when working in combustible dust environments, and GLPV has been providing these services, without incident, for more than 15 years. So how did we achieve this track record of safe vacuuming? From the very beginning, our founder and owner, Greta Smith, was determined to follow her vision of making our environment a cleaner, safer and better place for mankind. Such a lofty goal required the establishment of expertise firmly rooted in scientific principles and rigorous application of best practices. When it came to combustible dust vacuuming, GLPV looked to OSHA and NFPA guidance and standards for creating its combustible dust vacuum protocols. GLPV then employed a master electrician to implement these protocols in the real-world vacuuming environments. Through informed equipment selection, procedural guidelines, and detailed employee training GLPV implemented a coordinated effort to establish itself as the premier combustible dust removal and disposal resource in the Midwest. 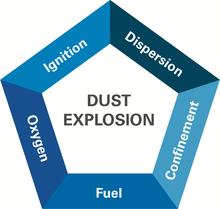 When examining the risks associated with combustible dusts, we must begin by looking at the five elements that must be present to trigger a dust explosion. These elements are often referred to as the “Explosion Pentagon” (as illustrated below). Lastly, an ignition source in the form of static electricity is present due to friction from the air and debris movement through tools and hoses (or if the vacuum motor is the wrong style of motor). In short, if you do not use the correct system, the risk of a vacuum explosion is high. Worse still, a primary explosion inside the vacuum equipment can potentially create a secondary explosion (through conflagration) in the facility that is capable of causing property damage, personnel injuries, and/or fatalities. In light of the above, the first step in assuring safety is to make certain that the vacuum system is equipped with a Totally Enclosed Fan Cooled (TEFC) or explosion-proof motor and is constructed of conductive materials. This removes the motor and vacuum from the list of potential ignition sources. Static electricity is the next most likely potential source of ignition once the motor and vacuum are removed. The material composition of the vacuuming equipment and the grounding of the system is also critical to eliminating this source of ignition. GLPV has various means of achieving a fully grounded vacuum system. Until recently, combustible dust projects were undertaken by GLPV using either one of our fleet of Vac Trucks or our proprietary Vent Vac (portable 480-volt 3-phase electric) vacuum unit, in conjunction with grounded and bonded aluminum pipe, grounded and bonded flexible steel hose and Kanaflex® static dissipative hose. In some cases, operators must also be grounded in which case they will wear an appropriate grounding device attached to the metallic equipment or structural members located near the work. GLPV has since added a new, unique Class II, Division 2 vacuum tooling system to our tool kit. This equipment features a conductive, lightweight carbon-fiber tooling used in conjunction with a Class II, Div 2 portable shop vac unit and Class II, Div 2 accessories. The tooling includes interlocked extension poles constructed with 100% carbon-fiber, impregnated with conductive resin along with a wide array of similarly conductive accessories and hoses. Simply put – this new tooling system, being electrically conductive from the brush to the end of the hose, allows static to be safely taken to ground through the Class II, Div 2 approved vacuum unit. DOES YOUR FACILITY REQUIRE COMBUSTIBLE DUST REMOVAL? For companies with processes that generate combustible dust, safety is a necessity, not a just a word or a concept. When you select GLPV as your combustible dust cleaning contractor, you can rest easy, knowing that GLPV has the experience, technical knowledge, highly trained staff, documented safety protocols, and state-of-the-art equipment necessary to ensure a safe and successful project outcome each and every time cleaning is performed. If your facility has combustible dust that needs removing, request a quote online today or give us a call at 800-822-4887.